Published by OR Books, New York and London. Visit our website at www.orbooks.com. All rights reserved. No part of this book may be reproduced or transmitted in any form or by any means, electronic or mechanical, including photocopy, recording, or any information storage retrieval system, without permission in writing from the publisher, except brief passages for review purposes. , now published in a revised and expanded paperback by OR Books. For more information please go to www.orbooks.com. The author wishes to thank Maren Hackmann for her assistance in preparing this pamphlet. , Richard Goldstone dropped a bombshell. He effectively disowned the massive evidence assembled in the report carrying his name that Israel had committed multiple war crimes and possible crimes against humanity in Gaza during its 2008-9 invasion. Israel was jubilant. “Everything that we said proved to be true,” Prime Minister Benjamin Netanyahu crowed. “We always said that the IDF [Israel Defense Forces] is a moral army that acted according to international law,” Defense Minister Ehud Barak declared. “We had no doubt that the truth would come out eventually,” Foreign Minister Avigdor Lieberman proclaimed. The Obama administration used the occasion of Goldstone’s recantation to affirm that Israel had not “engaged in any war crimes” during the Gaza assault while the U.S. Senate unanimously called on the United Nations to “rescind” the Goldstone Report. Some commentators have endeavored to prove by parsing his words that Goldstone did not actually recant. While there are grounds for making this argument on a technical basis, such a rhetorical strategy will not wash.
Goldstone is a distinguished jurist. He knows how to use precise language. If he did not want to sever his connection with the Report he could simply have said “I am not recanting my original report by which I still stand.” He must have known exactly how his words would be spun and it is this fallout—not his parsed words—that we must now confront. Goldstone has done terrible damage to the cause of truth and justice and the rule of law. He has poisoned Jewish-Palestinian relations, undermined the courageous work of Israeli dissenters and—most unforgivably—increased the risk of another merciless IDF assault. There has been much speculation on why Goldstone recanted. Was he blackmailed? Did he finally succumb to the relentless hate campaign directed against him? Did he decide to put his tribe ahead of truth? Richard Goldstone, former judge of the Constitutional Court of South Africa and former Prosecutor of the International Criminal Tribunals for the former Yugoslavia and Rwanda, was named head of the Mission. The Mission’s original mandate was to scrutinize only Israeli violations of human rights during the assault on Gaza, but Goldstone made his acceptance of the job conditional on broadening the mandate to include violations on all sides. The council president invited Goldstone to write the mandate himself, which Goldstone did and which the president then accepted. “It was very difficult to refuse . . . a mandate that I’d written for myself,” Goldstone later observed. Nonetheless Israel did not cooperate with the Mission on the grounds of its alleged bias. In September 2009 the long-awaited report of the Goldstone Mission was released. It was a searing indictment not just of the Gaza invasion but also of the ongoing Israeli occupation. Because the Goldstone Mission (like human rights organizations) devoted a much smaller fraction of its findings to Hamas rocket attacks, critics accused it of bias. The accusation was valid, but its weight ran in the opposite direction. If one considers that the ratio of Palestinian to Israeli deaths stood at more than 100:1 and of dwellings ravaged at more than 6000:1, then the proportion of the Goldstone Report given over to death and destruction caused by Hamas in Israel was much greater than the objective data would have warranted. columnist Gideon Levy, it was subjected for months to a torrent of relentless abuse across the Israeli political spectrum and at all levels of society. that “the logical response to this debacle is to withdraw from and defund” the Human Rights Council. Harvard’s Alan M. Dershowitz alleged that the Goldstone Report “is so filled with lies, distortions and blood libels that it could have been drafted by Hamas extremists”; that it recalled the “Protocols of the Elders of Zion” and was “biased and bigoted”; that “every serious student of human rights should be appalled at this anti-human rights and highly politicized report”; and that Goldstone was “a traitor to the Jewish people,” an “evil, evil man” and—he said on Israeli television—on a par with Auschwitz “Angel of Death” Josef Mengele. In fact Dershowitz conjured a straw man: the Goldstone Report never said or implied that the principal objective of Israel’s attack was to murder Palestinians. If the Report did allege this, it would have had to charge Israel with genocide—but it didn’t. ONE MIGHT WONDER why the Goldstone Report should have triggered so much vituperation in Israel and set off a global diplomatic blitz to contain the fallout from it. After all, the Goldstone Mission’s findings were merely the last in a long series of human rights reports condemning Israeli actions in Gaza, and Israel has never been known for its deference to U.N. bodies. Goldstone has also claimed the Nazi holocaust as the seminal inspiration for the international law and human rights agenda of which he is a leading exponent. Because of Goldstone’s credentials, Israel could not credibly play its usual cards—“anti-Semite,” “self-hating Jew,” “Holocaust denier”—against him. In effect Goldstone’s persona neutralized the ideological weapons Israel had honed over many years to ward off criticism. Compelled to face the facts and their consequences, disarmed and exposed, Israel went into panic mode. Influential Israeli columnists expressed alarm that the Goldstone Report might impede Israel’s ability to launch military attacks in the future. Prime Minister Netanyahu ranked “the Iranian [nuclear] threat, the missile threat and a threat I call the Goldstone threat” the major strategic challenges confronting Israel. In the meantime Israeli officials fretted that prosecutors might pursue Israelis traveling abroad. And indeed, shortly after the Goldstone Report was published, the International Criminal Court announced it was contemplating an investigation of an Israeli officer implicated in the Gaza invasion. In December 2009 Tzipi Livni cancelled a trip to London after a British court issued an arrest warrant for her role in the commission of war crimes while serving as foreign minister and member of the war cabinet during the invasion. On 1 April 2011 Israel’s headache went away. on the grounds that “we know a lot more today about what happened” during the Israeli invasion than when the Mission compiled the Report. On the basis of this alleged new information he suggests that Israel did not commit war crimes in Gaza and that Israel is fully capable on its own of investigating any violations of international law that did occur. It is correct that much new information on what happened during the Israeli invasion has become available since publication of the Mission’s Report. But the vast preponderance of this new material sustains and even extends the Report’s findings. In addition to those already cited in the Goldstone Report, many more Israeli combatants stepped forward in 2010 to confirm egregious aspects of the Israeli invasion. Goldstone could have cited this new information to buttress the Mission’s Report but chose to ignore it. Goldstone could have cited this new information to buttress the Mission’s Report but again chose to ignore it. How is it possible to take seriously Goldstone’s claim that the facts compelled him to recant when he scrupulously ignores the copious new evidence confirming the Mission’s Report? The Israeli document was based on unverifiable “reports from IDF forces” and “Israeli intelligence information,” indecipherable photographic evidence and information gathered from “terrorist operatives” who had been tortured. It is hard to reconcile the mendacity of Israel’s most ambitious attempt to refute the Goldstone Report with Goldstone’s claim that new Israeli information fatally undermines the Mission’s findings. THE HEART of Goldstone’s recantation is that on the basis of new information he has concluded that “civilians were not intentionally targeted as a matter of policy.” It is not entirely clear what is being asserted here. , his recantation is gratuitous because the Mission’s Report never made such a claim. If the Report had made such a claim it would have verged on charging Israel with genocide. But the Report never even came close to entertaining, let alone leveling, such a charge. op-ed that new information calls this evidence into doubt. Israeli leaders themselves did not shy away from acknowledging the indiscriminate, disproportionate nature of the attack they launched. its natural and foreseeable consequences” (Judge Christopher Weeramantry, International Court of Justice). Thus, an indiscriminate, disproportionate attack that inevitably and predictably results in civilian deaths is indistinguishable from a deliberate and intentional attack on civilians. If Goldstone now believes that because Israel did not intentionally target civilians for murder it is not guilty of war crimes, he ought to brush up on the law: an indiscriminate, disproportionate attack on civilian areas is no less criminal. If he now believes that it is not criminal behavior for an invading army to go “wild,” demonstrate “real hooliganism,” carry on like a “mad dog,” act “lunatic” and “crazy,” and “destroy everything in its way,” then he should not be practicing law. Goldstone has excised all the evidence casting doubt on the new Israeli alibi. His depiction of the facts in his recantation might be appropriate if he were Israel’s defense attorney but it hardly befits the head of a Mission that was mandated to ferret out the truth. GOLDSTONE JUSTIFIES his recantation on the grounds that “we know a lot more today.” It is unclear however what, if anything, “a lot more” consists of. He points to the findings of Israeli military investigations. But what do “we know . . . today” about these in camera hearings except what Israel says about them? In fact Israel has furnished virtually no information on which to independently assess the evidence adduced or the fairness of these proceedings. It is not even known how many investigations are complete and how many still ongoing. Although he claims to “know a lot more,” and bases his recantation on this “a lot more,” neither Goldstone nor anyone else could have independently assessed any of this purportedly new information before he recanted. before coming forth with such a simple explanation. reproduced numerous Israeli aerial photographs taken during the Gaza assault. Why has Israel still not made publicly available this drone image that allegedly exonerates it of criminal culpability for the most egregious incident of which it was accused? Didn’t the Givati commander check with these soldiers on the ground before launching the murderous attack to make sure they were out of harm’s way? Didn’t he ask them whether they saw men carrying rocket launchers and didn’t they reply no? Israel might be able to furnish plausible answers in its defense. But Goldstone does not even bother to pose these obvious questions because “we know . . . today”—Israel said so—it was just a simple mistake. Do “we know . . . today” that the evidence of war crimes assembled in the Goldstone Report and thousands of pages of other human rights reports was all wrong just because Israel says so? Did we also “know” that Israel didn’t use white phosphorus during the Gaza assault because it repeatedly denied doing so? THE ONLY other scrap of new information Goldstone references in his recantation is the recent figure supplied by a Hamas official of the number of Hamas combatants killed during the invasion that “turned out to be similar” to the official Israeli figure. This Hamas figure appeared to confirm Israel’s claim that the majority of Gazans killed during the invasion were combatants, not civilians. But then Goldstone notes parenthetically that Hamas “may have reason to inflate” its figure. So why does he credit it? To prove that it defeated Israel on the battlefield Hamas originally alleged that only 48 of its fighters had been killed. After the full breadth of Israel’s destruction became apparent and the claims of a battlefield victory rang hollow, and in the face of accusations that the people of Gaza had paid the price of its reckless decisions, Hamas abruptly upped the figure by several hundred to show that it too had suffered major losses. Whereas Goldstone now defers to this politically inflated Hamas figure, the Mission’s Report relied on numbers furnished by respected Israeli and Palestinian human rights organizations, each of which independently and meticulously investigated the aggregate and civilian/combatant breakdown of those killed. Disputing Israel’s claim that only 300 Gazan civilians were killed, these human rights organizations put the figure at some 800-1,200 and also demonstrated that Israeli figures lacked credibility. But because a politically manipulated Israeli figure chimes with a politically manipulated Hamas figure, Goldstone discards the much larger figure for Palestinian civilian deaths documented by human rights organizations and even validated by the U.S. State Department. 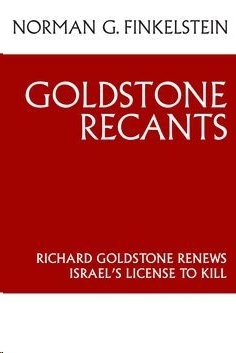 IN HIS RECANTATION Goldstone says he is “confident” that Israeli military investigations will bring those guilty of wrongdoing to justice and goes on to assert that Israel has already “done this to a significant degree.” In fact in this instance we do have new data since publication of the Mission’s findings but, alas, they hardly buttress Goldstone’s newfound faith. In the course of Israel’s assault on Gaza, it damaged or destroyed “everything in its way,” including 280 schools and kindergartens, 1,500 factories and workshops, electrical, water and sewage installations, 190 greenhouse complexes, 80 percent of agricultural crops, and nearly one-fifth of cultivated land. Entire neighborhoods in Gaza were laid waste and some 600,000 tons of rubble were left behind after Israel withdrew. More than two years after the Gaza invasion the only penalty Israel has imposed for unlawful property destruction was an unknown disciplinary measure taken against one soldier. Both the Goldstone Report and human rights organizations concluded that much of this death and destruction would constitute war crimes. More than two years after the Gaza invasion the only Israeli soldier who did jail time for criminal conduct served seven months after being convicted of credit card theft. After this wondrous show of contrition how could Goldstone not be “confident” of Israel’s resolve to punish wrongdoers? IN HIS RECANTATION Goldstone can barely contain his loathing and contempt for Hamas. He says that—unlike in Israel’s case—Hamas’s criminal intent “goes without saying—its rockets were purposefully and indiscriminately aimed at civilian targets.” The Mission’s Report had reached this conclusion on the basis of a couple of statements by Hamas leaders combined with Hamas’s actual targeting of these civilian areas. It is unclear however why comparable statements by Israeli officials combined with Israel’s purposeful and indiscriminate targeting of civilian areas in Gaza no longer prove Israel’s criminal guilt. In fact judging by the Mission’s findings, none of which Goldstone recants, the case against Israel was incontrovertible. Goldstone also chastises Hamas because—unlike Israel—it has “done nothing” to investigate the criminal conduct of Gazans during the Israeli invasion. Hamas attacks killed three Israeli civilians and nearly destroyed one civilian home. The Israeli assault on Gaza killed as many as 1,200 civilians and nearly or totally destroyed more than 6,000 civilian homes. Hamas did not sentence anyone to prison for criminal misconduct whereas Israel sentenced one soldier to seven months prison time for stealing a credit card. Isn’t it blazingly obvious how much eviler Hamas is? In his recantation Goldstone avows that his goal is to apply evenhandedly the laws of war to state and non-state actors. It is unlikely however that this admirable objective will be advanced by his double standards. Goldstone now rues his “unrealistic” hope that Hamas would have investigated itself, while his detractors heap ridicule on his past naiveté. How could a terrorist organization like Hamas have possibly investigated itself? Only civilized countries like Israel are capable of such self-scrutiny. Indeed Israel’s judicial record is indisputable testimony to this capacity. The Israeli human rights organization Yesh Din found that, although thousands of Palestinian civilians were killed during the second intifada, only five Israeli soldiers were held criminally liable and not a single Israeli soldier was convicted on a murder or manslaughter charge, and that 80 percent of the investigations of violent assault by Israeli settlers against Palestinians in 2005 were closed without criminal indictments. of unverifiable assertions by parties with vested interests. The fact that Goldstone cannot cite any genuinely new evidence to justify his recantation is the most telling proof that none exists. Goldstone was not the only one who came under attack. The U.N. Human Rights Council appointed the eminent international jurist Christian Tomuschat to chair a follow-up committee mandated to determine whether Israeli and Hamas officials were investigating the allegations in the Goldstone Report. Deciding that Tomuschat was insufficiently pliant, the Israel lobby hounded and defamed him until he had no choice but to step down. Many aspects of Goldstone’s recantation are perplexing. Goldstone has the reputation of being very ambitious. Although he was savaged after publication of the Report, the tide began to turn in his favor this past year. It is puzzling why an ambitious jurist at the peak of a long and distinguished career would commit what might be professional suicide, alienating his colleagues and throwing doubt on his judgment, when the tide of public opinion was turning in his favor.